The three boats, Wyntersea, Toketie, and Hanali all headed out early to sail to Muertos Cove. We ended up sailing about 10-15 miles out most of the day, but because we were beating all the way we had to keep tacking back and forth. The winds were good, about 15-20 knts, and the three of us were having a good sail. Because we were beating into the wind, Laura and I didn't think we'd make it by dark on this course, even though it was only about 47 miles. We decided to break away from the pack and head closer to shore to follow our original rhumb line. Once we got closer, even though we were beating, we found that we could pinch Hanali really close to the wind which allowed us to do short tacks and zig zag through our rhumb line. We were doing 5-6 knts, same as further out, but we'd get there faster now. We ended up pulling into Muertos anchorage as it was getting dark and got the hook down with the last bit of light left. The next morning we re-anchored a little closer in. We found out Wyntersea didn't get in until about 11pm but there was no sign of Toketie... Toketie was still having a problem with their engine and could only run it for short periods. With the Northerlies coming in and having to beat with no engine it really took a long time for them. But they made it, at last, about 24 hours after us. We all ended up staying about a week riding out the Northerlies before we could head to La Paz. All in all 8 more boats ended up here riding out the weather. The Giggling Marlin was selling a lot of beer that week! Most days and nights it blew 25-35 knts with small choppy seas so we were on anchor watch a lot. And, stuck on the boat a lot. We did have a couple of days where it wasn't too bad and got to play around the area. This cove is really an awesome place but it's starting to get developed. Lots of Euros and Americans are buying land. 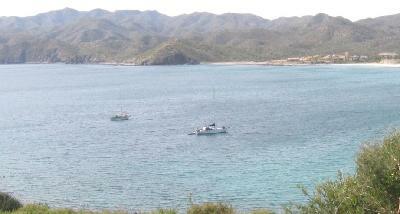 We heard that it will have a marina soon and the bay willed be called "Bahia De Los Suenos" ( Bay of the Dreams). Personally we like it the way it is, still pristine, Muertos Cove. While we were at anchor here for so long we ended up getting together with Toketie and Wyntersea a lot. We had hikes, cocktails, dinners, lunches, more cocktails and lots of fun. Through all this they ended up becoming good friends. Even though this was a beautiful place we were all ready to head to La Paz. Just waiting for a break in the weather.